Dogs play, jump, run, and do all sorts of things that can lead to accidents that result in injuries, like broken toes. It's possible that sometime in your dog's life, it will break a toe. Some of these bones are more prone to fractures than others, and treatment options vary depending on where the break is. If you notice lameness or limping, instability or abnormal movement, or a swollen paw, your dog may have a broken toe. Of course, if the break is severe, the dog will also be in pain and will likely cry or whine. A visit to the vet is warranted if you suspect your dog may have broken a toe. X-rays are needed to determine the nature of the fracture, its location, severity, and whether the break involves the weight-bearing toes. How Do Dogs Break Their Toes? Dogs have four larger bones on their hind limbs (metatarsals) and forelimb paws (metacarpals). Three smaller bones attach to each of the metatarsal and metacarpal bones, forming the toes. These toe bones are called phalanges. The two middle toes bear most of a dog's weight. Fractures in these digits are more likely to lead to lameness than when the outer toes are broken. When the joint isn't affected by the fracture, the long-term effects are usually mild and may not even be apparent. However, when a joint is affected, arthritis may develop down the line, leading to chronic pain and lameness. One of the leading causes of toe injuries in dogs is car accidents, specifically being hit by a car. It's yet another argument to keep your dog leashed at all times when it's outside your home or fenced backyard. Having its toe stepped on or catching its foot on something like a stray board on a wooden deck is another way dogs may break their toes. Treatments vary based on the severity of the injury and whether the dog has suffered any secondary issues. Treatments may include a splint on the foot to immobilize the limb, injectable or oral pain medications, and surgery. NSAIDs (nonsteroidal anti-inflammatory drugs) are what veterinarians prescribe most frequently for dogs that are in pain. Note that you should never give your dog NSAIDs used for humans, such as aspirin or ibuprofen; there are several NSAIDs formulated specifically for dogs. Be sure to ask the vet about proper dosage, when the dog should receive its pain medication, whether it should be given with or without food, and what to do if your pet has an adverse reaction. Behavior and appetite changes, skin rashes or redness, and diarrhea are all signs your dog may be having a negative reaction to a NSAID. If you observe any of these signs, consult your vet immediately. Metacarpal and metatarsal fractures are fairly common canine injuries. If your veterinarian recommends using a splint to immobilize the toe, your dog may need to wear it for up to 12 weeks for the bone to fully heal. During this time, the splint should be changed at least weekly to reduce the risk of pressure sores due to the lack of soft tissue coverage. If the splint gets wet or dirty, it will need to be changed more often. If more than one bone in your dog's foot is broken, a splint may not be sufficient to treat it properly. Most veterinarians recommend surgery in these cases to prevent any malformation of the foot as the bones heal. During surgery, the veterinary surgeon realigns the bones and secures them in place with wires, screws, and pins. In extreme cases or when a previously splinted toe does not properly heal, your vet may recommend amputation of the dog's toe. If it's an outer toe, most dogs can tolerate amputation without too much impediment to walking. If the toe is on the inner part of the foot, amputation would be considered a last resort, since losing one of the larger toes can affect how well a dog walks and otherwise gets around. In the event that your dog falls or is involved in an accident and you suspect it has broken its toe, prevent it from using the foot or bearing weight on the leg with the injured toe, and take it to the vet as soon as possible. If the vet puts your dog's foot in a splint, limit the dog's activity for the requisite amount of time. Revisit how the bone is healing by checking in with your vet in several weeks as instructed. Another X-ray will be taken at that time to monitor your dog's progress, and the vet will let you know when you can increase your dog's activity. 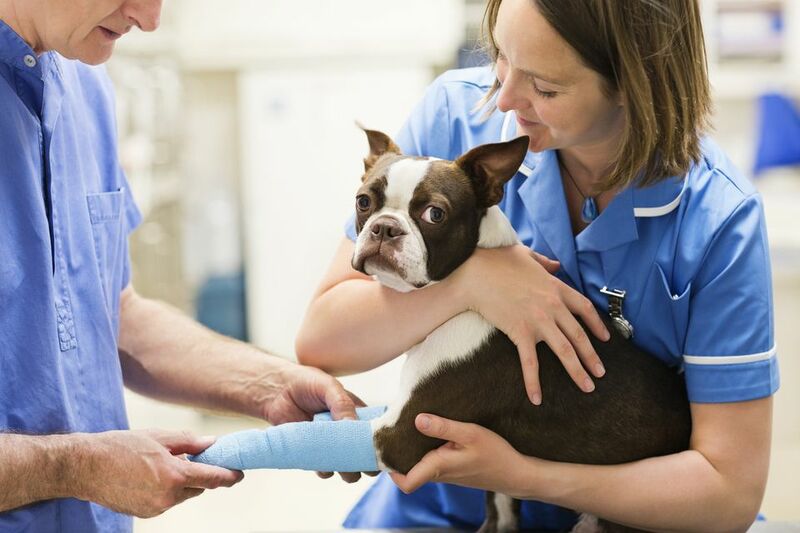 Following surgery, your vet will give you specific instructions on how to handle your recuperating pup, such as possibly confining your normally rambunctious pet to a crate, restricting activities for several days, and temporarily limiting food and water intake, among others. Keep your dog in a fenced-in yard and always walk it on a leash. Train your dog to use a pet ramp or steps instead of jumping off beds and other furniture. Take care with your dog when using stairs or steps or opening and closing doors that can catch its paws. Avoid venturing into unfamiliar neighborhoods where the dogs may be unfriendly. Why Is My Dog's Skin So Irritated?